Knitting Relaxes Me: Happy Birthday to Me! 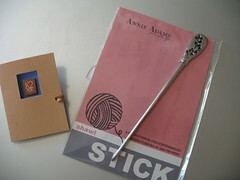 Yes, it's my birthday, and I got some knitting-related gifts! My sister sent me a Shawl Stick and a little K2tog pin. I think she got them both at Yarn Barn in San Antonio, and I love them both! I also got two knitting books. Knitting in the Sun is full of great patterns -- Santorini and Bordeaux are all already in my Ravelry queue, and I'm sure others will join them. I also received a copy of Luxury Yarn One-Skein Wonders, which also has great patterns. The friend who gave it to me admits, though, that the deciding factor was the toddler sized elephant hat. (Rav link - sorry!) I'm trying to decide if I can upscale it to fit her! I'm still working on Buttercup, and it's going well. I went back to finish the sleeves and neckline before I continue on the body. That way, I won't be worried about running out of yarn. I'll probably finish the neckline this evening, so I'll post a photo of that much next time. Happy Birthday! I'm glad you're on the blogging planet! Love the pin! I've got one of those, but a black and white sheep/love one. Very cool! I'm so sorry I missed it!! !